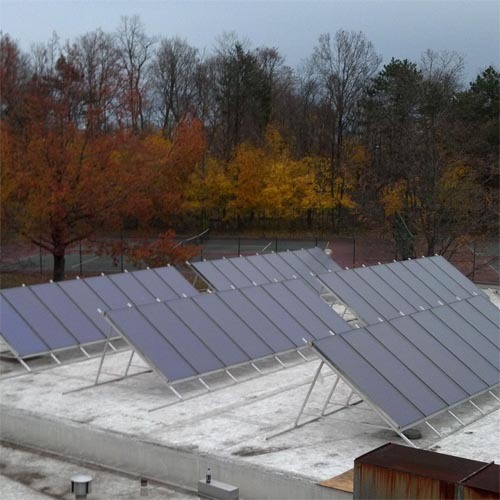 Solar thermal energy (STE) describes technology that uses the sun’s energy to produce heat. There are three temperature categories of energy collectors: low, medium and high. Flat plates are used for space heating in residential and commercial venues and for heating residential swimming pools. Stone, concrete or water store the solar thermal energy during the day and release it when it gets cool. One example is a solar thermal chimney (used for ventilation). Air is heated inside, causing an updraft that circulates air through the building. A solar pool heater works by using a solar hot water collector; pool water is pumped into thin pipes and the sun heats the water. The pipes are part of a solar thermal collector which transfers the heat of the sun to the water. These collectors are used for residential and commercial hot water and cooking. 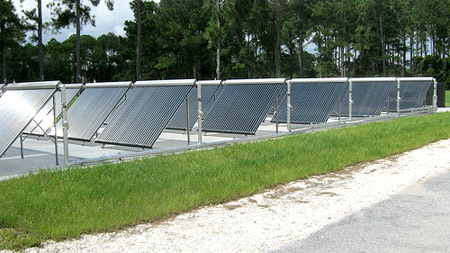 Commercial systems also use solar thermal collectors for distillation. There are a wide range of designs used for residential water heating. A pressurized glycol system uses a water and antifreeze mix which circulates through pipes and is pumped into a collector. Water is warmed by solar thermal heat transfer in the pipes. A drain back system circulates distilled water from a reservoir to a solar thermal heat exchanger, passing heat to the water. A batch system uses a tank of water in an insulated box which is placed in the sun. Solar thermal cookers can be as simple as a box with an insulted, transparent lid. Temperatures in the cooker can range from 50-100 degrees Celsius. The largest solar cooker is a dish with a reflective surface in India. It can cook up to 35,000 meals a day. High temperature collectors use Concentrated Solar Power (CSP) for commercial purposes. Solar thermal energy is concentrated by mirrors or lenses to obtain the highest possible temperatures. These are used to heat liquids (or salt to molten consistency) which then drive steam turbines to produce electricity.